SANGUINE ROOT STAFF FINDS NATIVE WILDFLOWERS IN THE SOUTHWEST OF FRANCE THAT HAVE BEEN INTRODUCED TO NORTH AMERICA WHERE THEY HAVE BECOME NOXIOUS INVASIVE WEEDS. 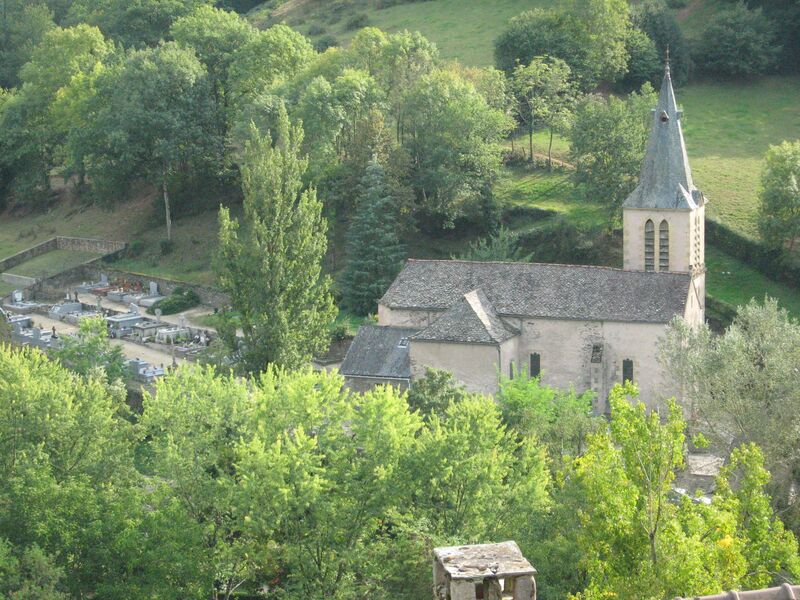 ALSO NEW DISCOVERIES ARE MADE OF INTERESTING NATIVE PLANTS AND TREES GROWING IN PICTURESQUE VILLAGES. Isabelle in her native habitat. 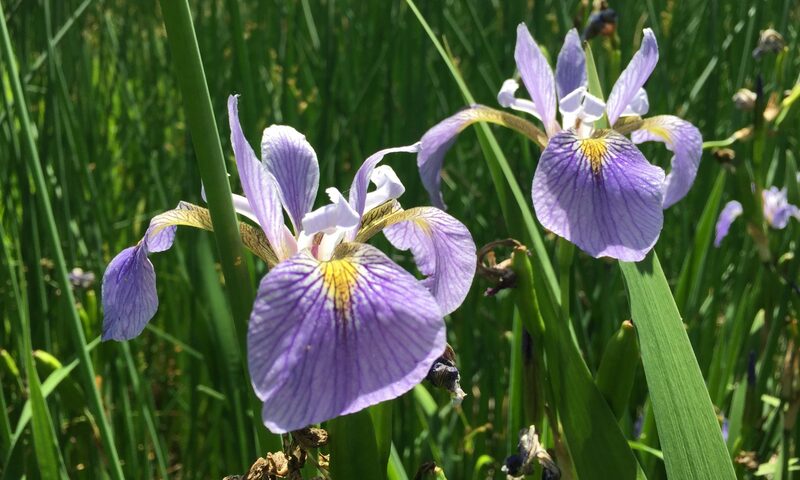 Our commenting readership has demanded more pictures that show the context of many of the plants we have been featuring in our adventures throughout France. 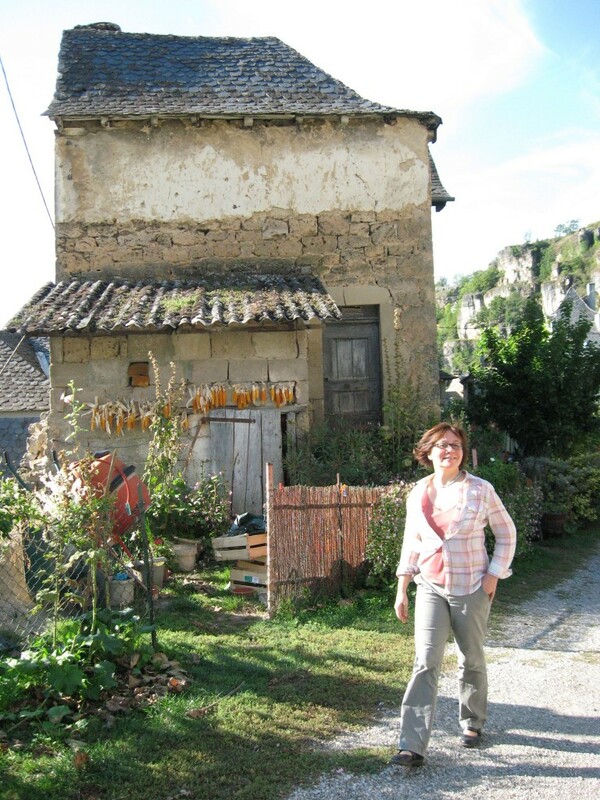 Our travels through the south of France have taken us to many charming villages, including one where Isabelle grew up. 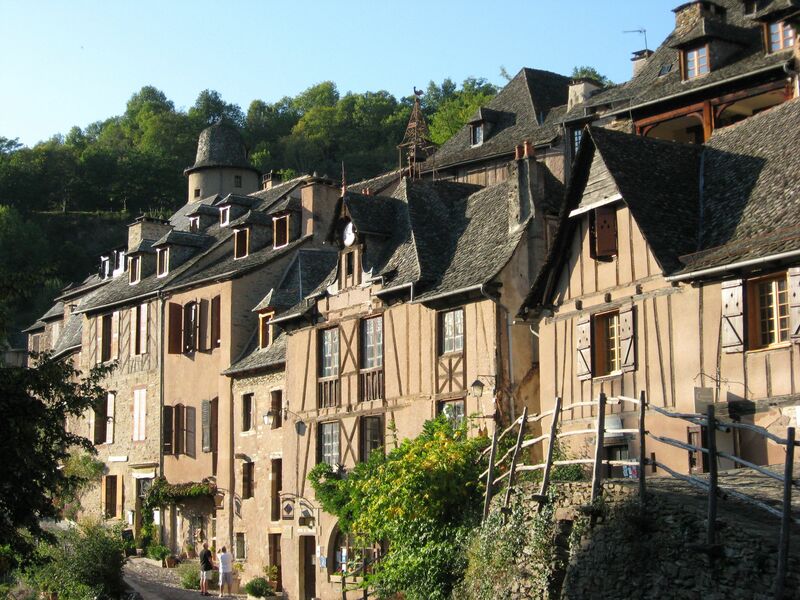 Many of these villages date back to at least the 12th century and have an inventory of buildings that represent every century since, making for a fascinating display of architecture and history, much of which is proudly well preserved. 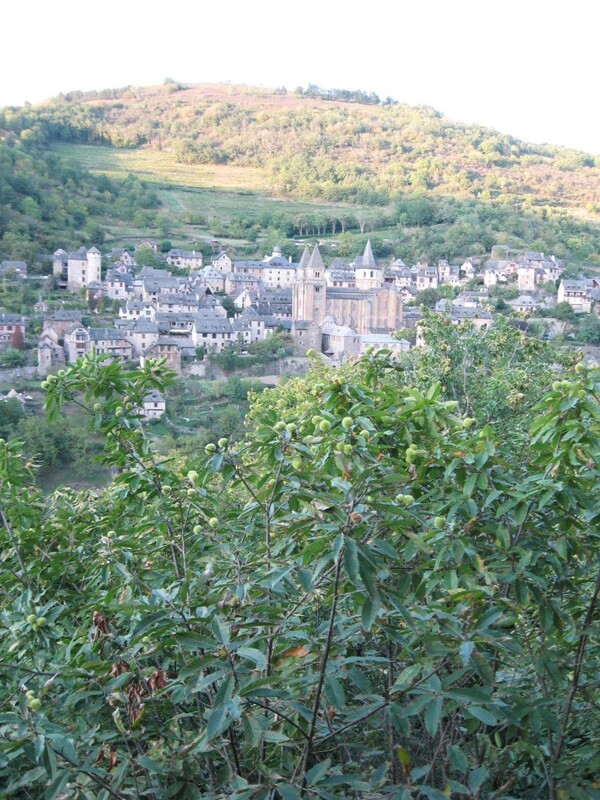 The town of Salles-La-Source was nestled on a steep hillside. 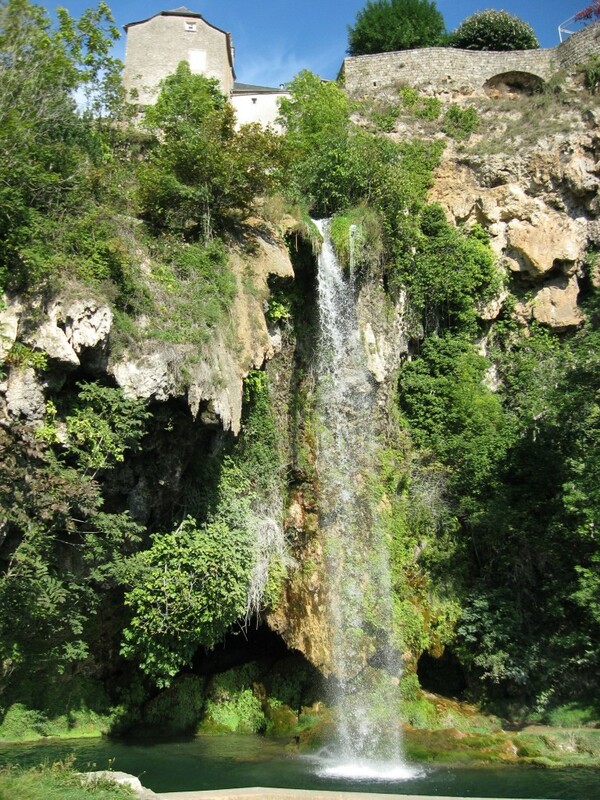 A beautiful waterfall cascaded down from the edge of the town. The waterfall created a rich environment full of ferns growing out of the rocks. 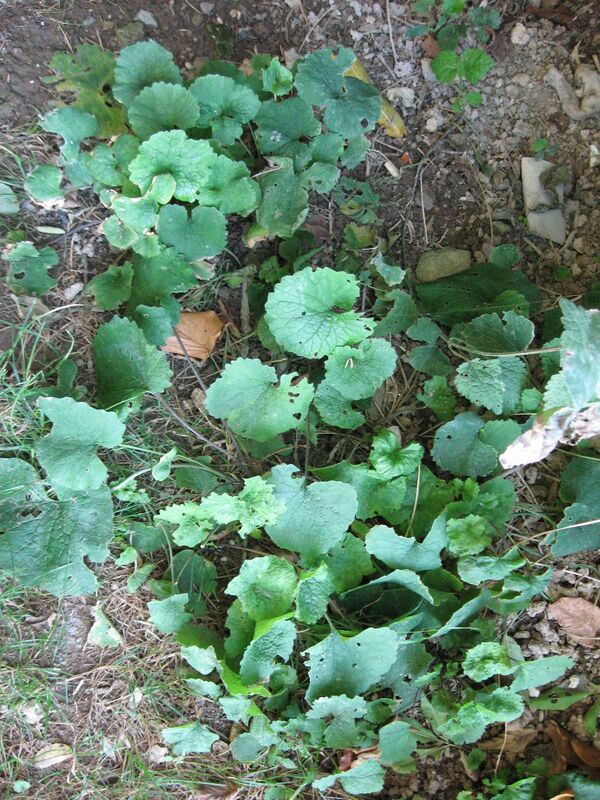 It was here that we discovered a native wildflower growing naturally in its habitat, a plant that has invaded Morris Park and many forests across the eastern half of America, the Garlic mustard, Alliaria petiolata. What an exciting find! Here is a plant that we have been pulling out of the forest in Philadelphia for years, and here it is growing in its native habitat! The plant has already gone to flower and it is now only a few leaves for the rest of the growing season and through the winter. 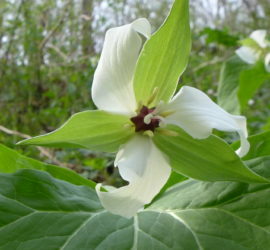 Seeing this plant as a native plant, belonging to a place has a degree of importance in our experience overall in our adventures in environmental restoration. We spend so much time removing this plant from one habitat, trying to understand that it is not the plant that is a problem, but the context, geography and history of the plant that is problematic in specific locations and continents. Its all about the location of the plant. Here is one location that we can feel at ease with this plant and admire its beauty in its natural range. The leaf at the very bottom of the picture is English Ivy, Hedera helix, also in its native habitat. English Ivy is an invasive exotic in North America. 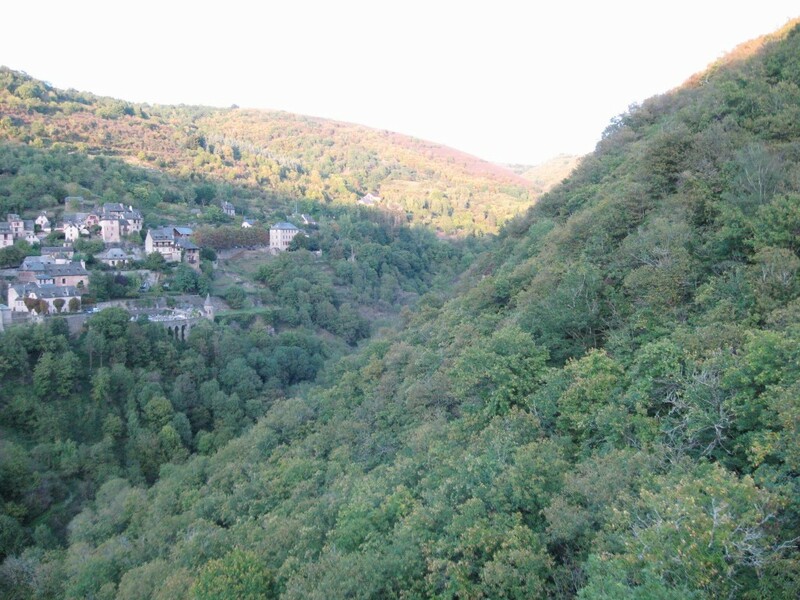 The hillside next to Conques is full of the native Chestnut trees, Castanea sativa, loaded with fruit, growing all the way up to the summit. 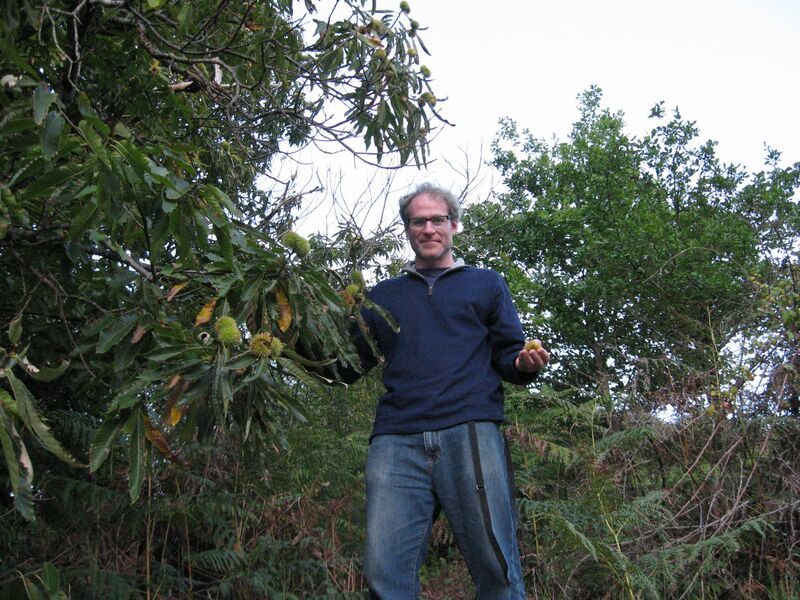 It is astonishing how similar this species is to the American Chestnut, the Castanea dentata. The Sativa is blighted as well, from the same fungus, Cryphonectria parasitica, but has not suffered the devastating consequences as of yet as our dentata has. 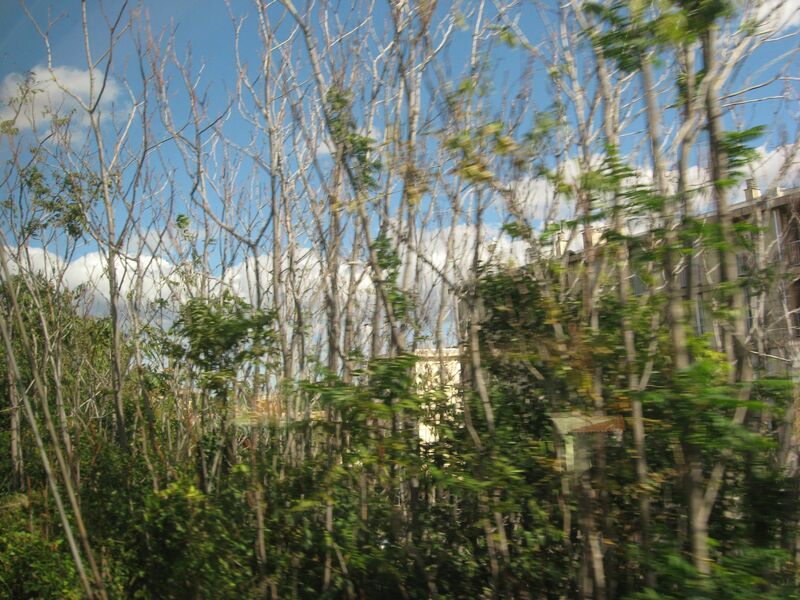 However, the blight is prevalent in every population we examined, which we did in a vast range extending across 100s of kilometers. When we began examining the plants around town , an interesting picture began to unfold, and it was not the one we expected. Many trees in the town were the same ones we have in Philly, the Ailanthus altissima, the Tree-of Heaven. To the left is Pampas grass, a South American native, unfortunately having found itself in Conques, totally out of place. The tree to the right is the Chinese native Alianthus altissima, the tree-of-heaven, which has completely invaded France and can be found in every town we saw. Paris is the most invaded place we saw of this tree. The Ailanthus tree is so prevalant in France that it is beyond the scope of control. The Pampas grass is quickly working its way from the status of an emerging invasive to status of an establishment invasion the Ailanthus has achieved. 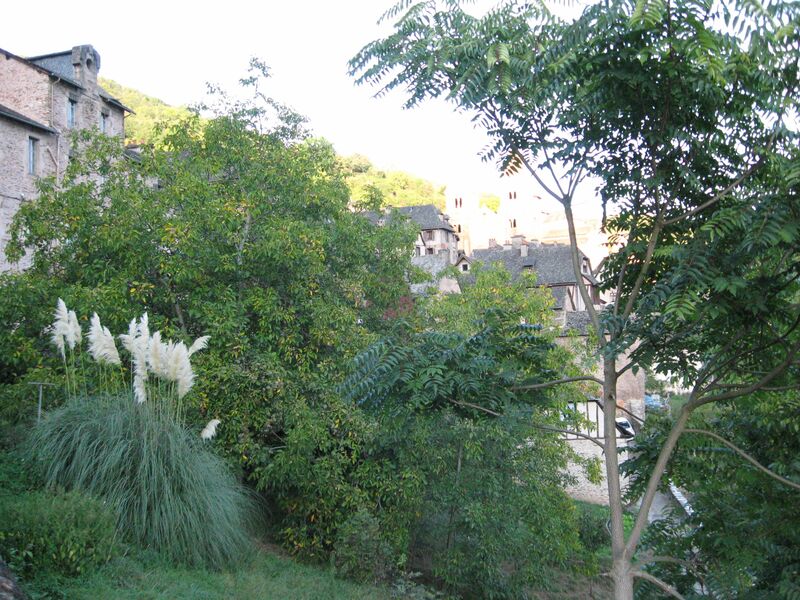 The Pampas grass is a very trendy garden ornamental and is being planted all over these charming French towns, giving them a silly look. Isabelle is disturbed by this unfortunate turn of events concerning the Pampas grass. They were not growing here when she was a child. To her they clash with the medieval landscape that the preservationists have sought to achieve. This is a hillside of the Chestnut trees, Castanea sativa. There are hiking trails all around Conques which is part of the Compostella trail. 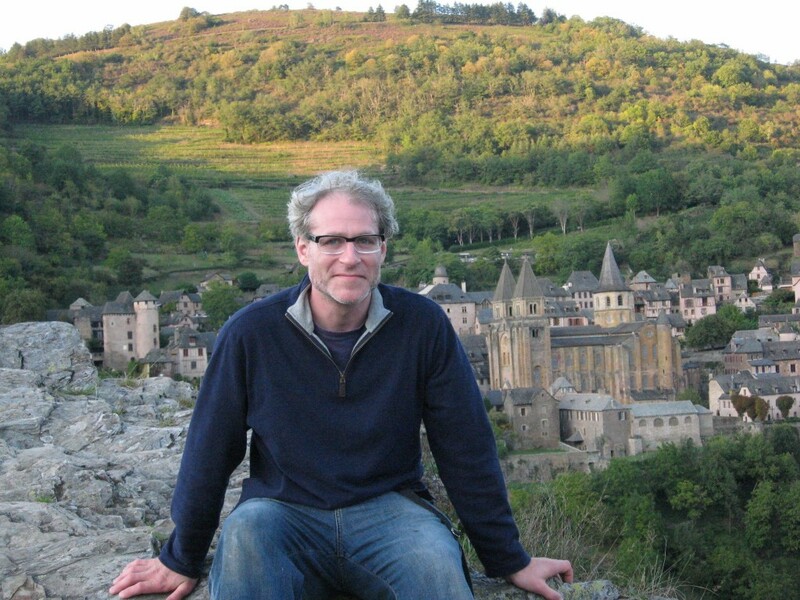 Here we are in the town of Belcastel. Behind this church we found more interesting surprises. This one, Japanese Knotweed! 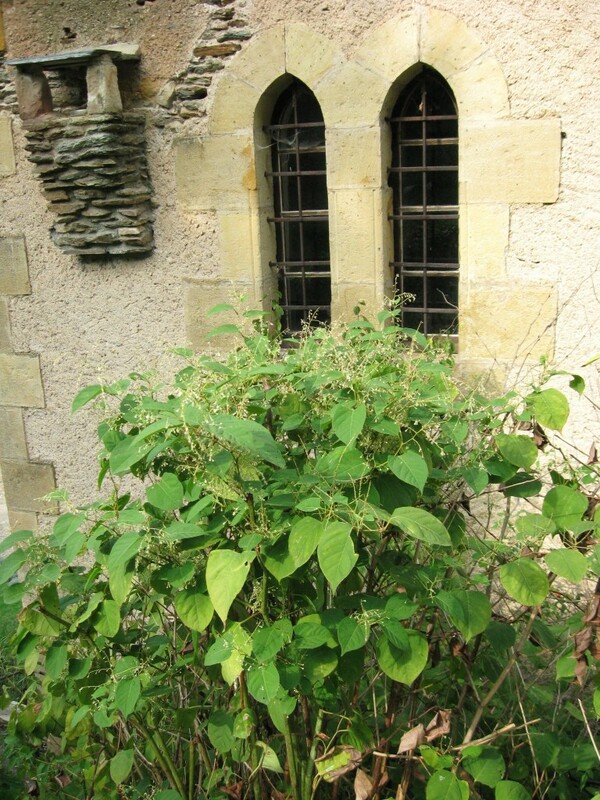 This nasty invasive is all over France too. We found a field of wildflowers, many of them various mints, and yet to be identified plants and more Garlic Mustard. 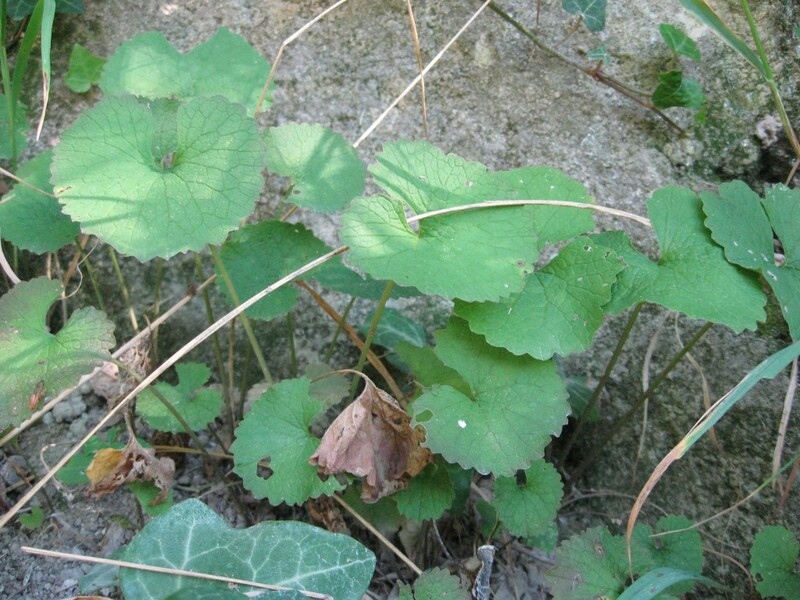 We found this plant growing on the hillside behind the church. 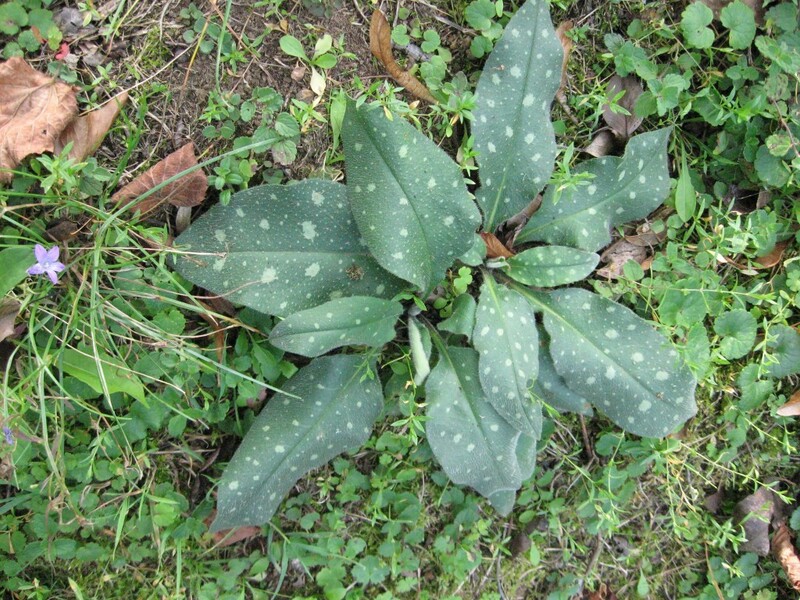 Its distictive spotted leaves caught our attention It looks native to this region doesn’t it? We guessed correctly, and it turns out to be called Pulmonaire affine, and is a common wildflower in France, and it has a blue flower, and is sometimes called Blue Cuckoo. It is used to make vermouth. Riding the TGV through the south of France, we pass through Nimes. A beautiful day, sunny Mediterranean skies, and a bottle of Bordeaux. 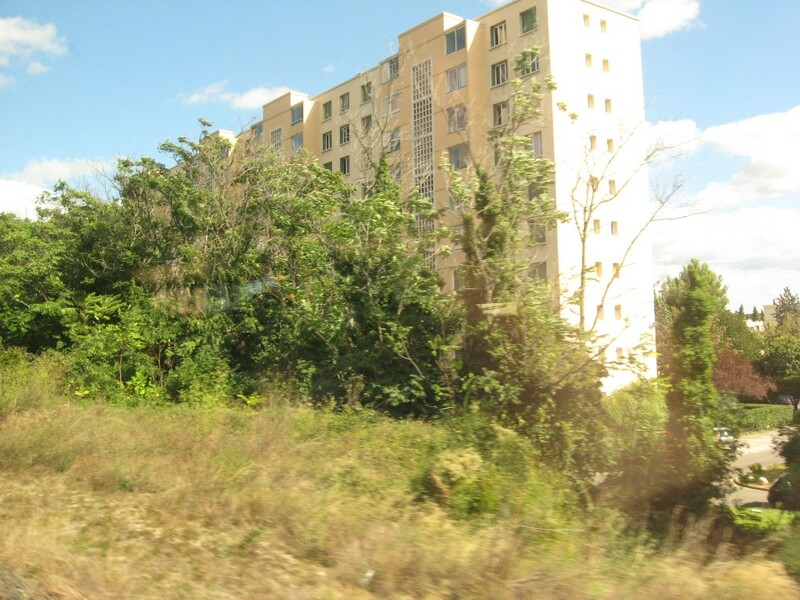 What is that tree growing in the middle of that vacant lot? Could it possibly be the Ailanthus? Oh yes. 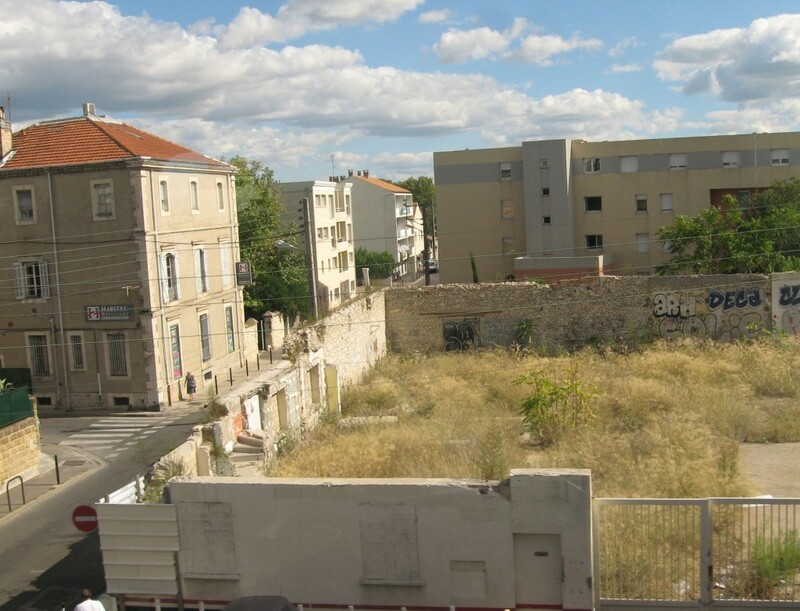 The tree native to the rich forests of central China has run rampant through Nimes, France as well as Paris. It’s growing out of the sides of buildings in Philadelphia, and covers whole forests in Virginia. No vacation from the globe-trotting Ailanthus tree.